Deep Silver has released a new trailer showcasing the upcoming modes in Codemasters new combat-racing game Onrush. The new title is being developed by a team created from the former members of Evolution, who were known for the Motorstorm series. Onrush seems to be a spiritual successor to those games, as it contains the same over-the-top crashes and car combat as Motorstorm. The trailer dives into the four main modes; Countdown, Lockdown, Overdrive, and Switch. In Countdown, players must work with their team against a timer as they pass through gates to slow the decay of the clock. At the same time, they must stop the opposing team from passing through gates and ensure their timer reaches zero to gain points. Lockdown sees king of the hill get a racing twist, as players must fight with their team for control of a moving zone, and do everything in their power to stop the opposing team from taking it. 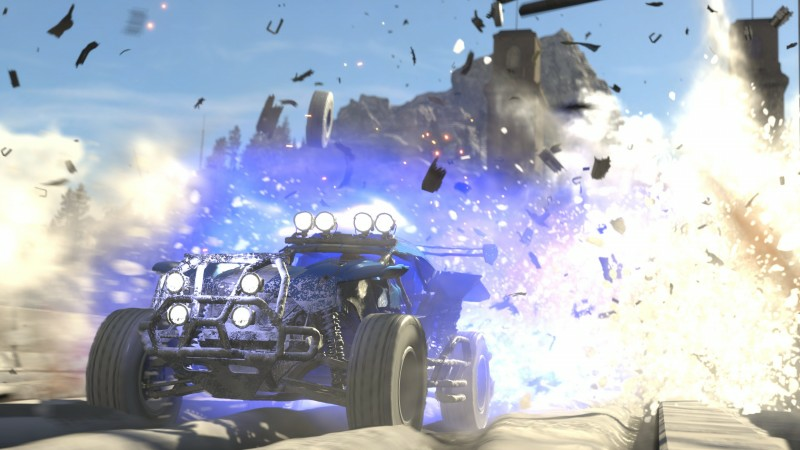 Overdrive mode is the classic Motorstorm style of racing where players earn boost by driving recklessly and causing opposing players to crash. Once enough of their meter is built up, players can use their boost to gain points. The final mode is Switch, where every time a player wrecks, they switch vehicle classes. After three crashes, they run out of switches and instead must take down opposing players who still have switches left. Alongside the trailer detailing the new modes, Deep Silver and Codemasters have released two developer diaries. The Onrush Transmission video series goes behind the scenes, focusing on the design of the game and the influences behind the crash-fueled racer. You can check those videos out on the official Onrush YouTube account. Onrush looks to be a different breed of racer and the influence Motorstorm has on its design shows in spades. The game comes out on June 6 on PlayStation 4 and Xbox One, and is available in standard and deluxe editions.